What is harder than finding the last foil-wrapped chocolate nugget in the family room Easter Egg hunt? A decent interest rate on an RESP eligible GIC - that is, your education nest egg. A GIC in an RRSP is something to consider as your child approaches the withdrawal period and you want to lock in the value of the principal investment (and the grants) - and get some return to cover inflation, before having to withdraw in the next few years. Many banks offer anemic GIC rates for products held within their RESP account. Some of the high yield GIC organizations (like Achieva) do not offer RESP accounts - so what to do? Go to a big bank like CIBC and get a 5 year GIC with a 2% rate in a RESP. A better plan is to go to ICICI which offers high rate RESP GICs. ICICI Bank Canada has selected Knowledge First Financial (formerly USC Education Savings Plans Inc.) as the exclusive provider of Registered Education Savings Plans to its customers. The Registered Education Savings Plans are products of Knowledge First Financial. 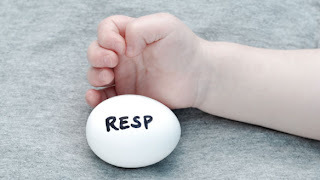 But is the RESP GIC really rate so important in these last couple years anyway? If you are depositing $2,500 a year to get the 20% government grant - $500 per year - the extra 0.2% to 1% return for a few years is not a big deal. The best decision you made was making the deposit. Someone holding the RESP deposit in cash 'earn's 20% over 3 years, someone holding a low interest RESP GIC may earn a compounded 21.8% (earning 0.5% a year interest), while someone with a high rate RESP GIC may earn 23.6% (earning 1% a year interest). So if you hunt for a great RESP GIC interest rate - and even double the interest earnings - you end up with just 3.6% more than the lazy bunny who did nothing - why? - because the grant is a big factor.